I read some quotes by Mr. Henri Bedros Kifa and I thought that those claims of his should be addressed in a logical way, so I wrote this article, hoping that it would shed some light on certain points and that their foundation of their aramean ideology is groundless! Note: that the Arabic and Syriac texts below are quotes by Mr. Bedros, and my response is in English. There is a major flaw in Mr. Henri Bedros’ logic! This flaw is that he starts with a definition, and then builds his theory or doctrine on it! And that definition is that Arameans = Syriacs (i.e. Suryoye). The problem is that if the foundation definition is wrong, then all his theory or ideology that is built on wrong foundations would collapse! Let’s take a look! Sure the Arameans lived in a region called Syria, no one can deny that! But there are several variables! 1. The Arameans are not the indigenous people of Syria, there were people who lived in Syria long before the arrival of Arameans. The first time we hear about Arameans in history, they were nomad Bedouin tribes that roamed the southern edge of the Syrian Desert. 2. Long before the arrival of the Arameans, there lived in Syria other nations that contributed their own civilization, such as: The Assyrians, Amorites, Canaanites, Hittites, Hurrians, Mittanis, Eblites, and Phoenicians, to name a few! 3. The borders of Syria expanded and contracted throughout history, from covering the whole Middle East during the Greek rule, to west of the Euphrates during Roman rule! So which borders of Syria are we talking about? 4. The name of Syria was derived from Assyria, and not Aram. 5. Add to that, that throughout history Syria was invaded by: Persians, Greeks, Romans, Byzantines, Arabs, Turks, Mongols, Crusaders, Kurds, British, French, Americans, and many settled in Syria. 6. The Arameans never ruled a country called Syria! There was never an Aramean king called the King of Syria! The maximum that Arameans achievement was a bunch of city states that were at odds with each other, where their loyalties were split between some Aramean city states were allies with Assyrians, while other Arameans city states were allies with Egyptians (since back then the two super powers were Assyria and Egypt), and those city states came to an end when the Assyrians conquered all the Middle East, and even Egypt. 7. Furthermore the term Suryoyo/Suryaya was stretched too! It started meaning Assyrian, and then expanded to mean anyone who lived in Syria during the Greek and Roman rule, and went beyond that with the spread of Christianity, where it was carried by the Suryoyo/Suryaya missionaries all the way to China, Mongolia, India, Afghanistan, Azerbaijan, Armenia, Persia, Arabia, and anyone who accepted Christianity as a faith became called a Suryoyo/Suryaya (Suryani). 8. The Neo-Assyrian Empire adopted Aramaic as its official language, hence Aramaic was spread throughout the Assyrian Empire, and all people who lived within its boundaries spoke it, (i.e. Aramaic was no more the language of Arameans, it became the language of different ethnic groups that are not ethnically Arameans. Hence with all those variables and facts, then the logical conclusion would be that by definition: A Syrian might be any of the above ethnic groups: Assyrians, Amorite, Canaanite, Hittite, Hurrian, Mittani, Eblite, Phoenician, Persian, Greek, Roman, Byzantine, Arab, Turk, Mongol, Crusader, Kurd, British, French, or American. And this brings us to the following question: Why does Mr. Bedros insist that Syrian means Aramean only? A logical conclusion would be the following: NOT all Arameans are Syrians, and NOT all Syrians are Arameans! (Notice that both are NOT!). For example: Ben Hadad who was an Aramean king of Damascus around 885 BC, wasn’t a Syrian, nor was he a Suryoyo/Suryaya! In fact during his lifetime the term Syria wasn’t coined nor used yet! In fact all Aramean kingdoms were never called Syrian kingdoms, for the same reason, the term Syria wasn’t used yet! The Name Syria came into the picture with the Arrival of Assyrians, and after they conquered all the Aramean kingdoms, It was the Greeks who gave the name “Syria” to “Assur” (which was used by Assyrians instead of “Ashur”, during the neo-Assyrian period), and consequently the name “Syria” was coined. In fact it was the Seleucids Greeks who established a kingdom called Syria (covering the region that was once Assyria), and their kings were known as King of Syria, (example: Antiochus King of Syria), but ethnically they were Greeks and not Arameans! Isn’t it ironic to realize that a Greek had the title of King of Syria, but no Aramean ever had that title! Later the Romans had the title of Governor of Syria for their Province Syria (west of the Euphrates River). For Aramean to be 100% equal to Syrian (Suryoyo/Suryaya/Syriac), then all the above eight points should not exist! But history tells us that they exist! And this is the Catch-22 that Mr. Bedros’ theory is struggling to hide in order to claim that the main definition on which his ideology is built is true. The 2nd problem with Mr. Bedros, is that he reads a certain text, but concludes some illogical or at least unsettling! Additionally he truncates it to quote just what he serves his goals, and occasionally sticks a word that wasn’t present in the original quote, just to further prove his claims. Translated to English: Mar Jacob of Suruj said that Mar Afram the Syriac, became the crown of all Arameans, and a great orator among Syriacs. Now let me give you a parallel example, by looking at the following statement: "I like the color Red, and I like the color Blue". Does that mean the color Red is the same as the color blue? Of course not! And anyone who equates the two lacks logic and is color blind! Now let’s compare that to Mr. Bedros conclusion that that statement implies that Arameans = Syriacs! Logically speaking if Syriac meant Aramean then Mar Jacob of Suruj wouldn't have repeated it in the same sentence, hence the reason the two names were mentioned in the same sentence was simply because they were different and represented distinct peoples, (i.e. Aramean meant Aramean people, and the other Syriac meant the Assyrian people, where Syriac was derived from Assyrian. In other words St. Mar Afram became the crown of Arameans and Assyrians. On the other hand the name “Syriac/Suryoyo/Suryaya/Suryani/Suraya/Suroyo” means “Assyrian” much more than it relates to “Arameans”, especially when it is used and applied to the heartland of Assyria (i.e. Upper Mesopotamia), another reason is that it was derived from Assyria. The Lebanese University School of Literature and Humanities – Fanar (a suburb of Beirut) History Department The disaster of the Edessian Assyrians (i.e. 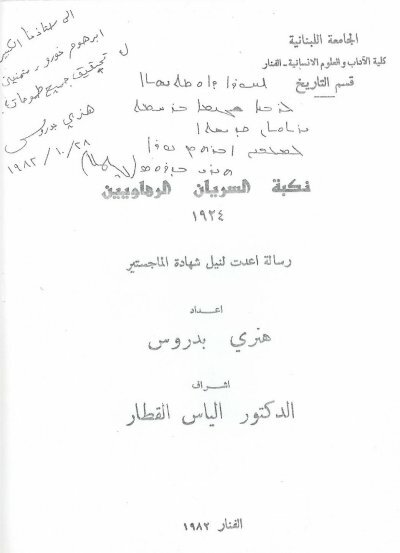 Edessa, Urhoy, Al-Raha, Urfa, a city in south Turkey) A thesis prepared for Masters Degree Preparer Henry Bedros Supervisor Dr. Elias Al-Qatar Fanar 1982 Note: The handwriting on the cover page is the signing of the book to Malfono Abrohom Nuro, dated: October 28th 1982. Meaning: The expression of mixing is present in most of the books of our fore fathers the Arameans or Greeks! Mr. Bedros concluded from the above that the ancestry is Aramean! I don't know how he figured that out, because the sentence talks about Aramean "or" Greek forefathers, notice the "or", hence there is a 50/50 percent chance that the forefathers might be Greek! So Mr. Bedros might be a Greek! Meaning: Mar Jacob of Edessa, said: "We Arameans or Suryoye...". Notice that Mr. Bedros chops the stanza of the poem here so that no one would understands the context in which it is said. Never the less it is more logical to understand this as Mar Jacob of Edessa was talking specifically about Aramean Syrians, because there were Arameans who were Syrian citizens. But this does not negate the existence of other Syrians who were not Arameans! (See above list of other nations that were Syrian citizens too). Meaning: Mar Dionosios Tal-Mahri (9th century) said, from that time, (845 AD) the descendants of Hager (i.e. the Arabs), enslaved the Arameans, as Egyptian slavery. I don’t know how this proves that anyone is Aramean! OK, this statement means that only the Arameans were enslaved by Arabs! (i.e. the ancestors of anyone who calls himself Aramean were enslaved by Arabs, but that’s it), It doesn’t mean that all citizens of Syria were enslaved, it is talking specifically about the Arameans, the ancestors of Mr. Bedros! Definitely it doesn’t mean that Syriac/Suryoye/Assyrians were enslaved! (4)ܘܦܩܕ ܚܔܔ ܕܠܐ ܢܩܘܡ ܪܝܫܐ ܠܟܪ̈ܝܣܛܝܢܐ. ܘܦܫܬ ܥܕܬܐ ܕܒܝܬ ܐܪ̈ܡܝܐ ܕܠܐ ܪܝܫܐ ܥܕܡܐ ܠܡܘܬܗ ܕܚܔܔ. Mr. Bedros is twisting the meaning of the original Syriac text and mistranslating it! The Hajjaj (an Umayyad Arab minister of defense) ordered that no leader to head (lead) the Christians, and the church of “Beth-Armaye” (i.e. the highlands, or the heartland of Assyria), remained without a leader until the death of the Hajjaj. Notice that it wasn’t “Bet-Aramaye” (Land of Arameans), but rather “Bet-Armaye” (the Highlands, and that is a geographical name for the plains of Nineveh and the heartland of Assyria), see glossary of Proper Names in the Louis Costaz Syriac/Arabic Dictionary, page 404, for the definition of Bet-Armaya, both Armaya and Aramaya are written the same in Syriac, but with different diacritical signs, and have different meanings and different pronunciations, and when no diacritical signs are used, some people are confused, but the context in which the sentence is written would clarify that. The Syriac Orthodox Patriarch Mor Mikhael Rabo (Michael the Great) wrote… (Ironically Mor Mikhael didn’t write in Arabic, and Mr. Bedros had listed only an Arabic text, so I doubt it is not made up or twisted!) Never the less assuming it is true, here is the meaning of the Arbic text: “With the help of God, we will state the news of the kingdoms that rose in ancient times, with the help of our Aramean nation, who were named Syriacs (Suryoye/Suryaye)”. Noting that I can’t see the Syriac text to judge, but Mr. Bedros might have twisted the term Highlanders into Arameans too as he did in the above quote of Bishop Eliya. Never the less there are other quotes by Patriarch Mor Mikhael Rabo that establishes the Assyrian identity of the Syriac people. 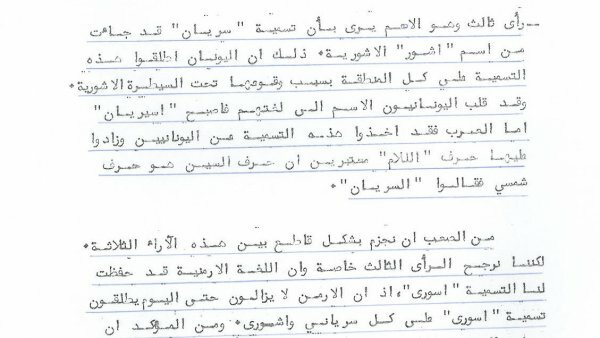 And below is a photo from his manuscript and in his own hand writing stating that Syriacs are Assyrians! As you see I had supplied the actual Syriac text, but Mr. Bedros avoided even a typed Syriac text, could he be trying to hide something? Noting that Mor Mikhael Rabo didn’t talk about the Aramean kingdoms, so what kingdoms was he referring to in his above statement? Mar Bar Ebroyo (13th century), wrote The Arameans didn’t want to mix with pagans! Well, very good, that’s what the above Syriac text says exactly! And that doesn’t prove the ethnicity of anyone. In fact it only proves that Arameans who became Christians didn’t mix (intermarried) with their own kind (ancestors), but rather with other Christians of different ethnicity! In other words that proves the dilution of the Aramean race! But what the above Syriac text doesn’t say is the misleading inset that Mr. Bedros included in the Arabic translation the tem (or Syriacs) misleading the Arabic reader. This stems from his desperate attempt to equate Syriacs/Syrians to Arameans, but in the process it backfired! Because that's a problem between Arabs and Arameans and we have nothing to do with it! In conclusion, if you study the Aramean movement and the writings of their so called scholars, the so called proof of their Aramean identity is so naïve and childish, because all they rely on is: So-and-so spoke Aramaic, or so-and-so wrote in Aramaic, therefore they conclude they are Arameans! And then they equate Aramaic to Syriac, and expand it to: So-and-so spoke Syriac, or so-and-so wrote in Syriac, therefore they conclude they too are Arameans! Forgetting that in modern days Professor Sebastian Brock reads, speaks and writes Syriac better than most of them, and yet he is not Aramean! and in the Old days the Patriarch Yab-Alaha was a Mongolian who also spoke Aramaic. Hence claiming that is a lame proof! Afrahat was a Persian and he was fluent in Syriac! Occasionally we see some writings in Syriac about isolated incidents where so-and-so is called Aramean, example Wafa the Aramean (in the city of Edessa), but that is because he is a stranger in a place where the majority are not Arameans, and that is why he was nicknamed as such. If all the population in Edessa were Arameans, how come only one was nicknamed as Aramean? The fact is that the minority stand out in a place where majority live, example: in an Italian village if they have one foreigner Frenchman, then he will be nicknamed the French, and that doesn't mean that all the village people are French! What they don’t realize that the Aramaic language was adopted by the Assyrian Empire, who spread that language to make it the Lingua-Franca of the East, stretching from Egypt to China and India, it became the language of Persia too, so were the Persians, Mongolian, Chinese, Indian, Afghanis, etc. all Arameans just because they spoke Aramaic? Similarly, English is the lingua-Franca of the World now, is every English speaker and Anglo-Saxon ethnically? Come on, people are smarter than that, give people some credit and respect their intelligence! Here is the strange logic of Mr. Henri Bedros, in one of his other posts he talks about the brutality of Assyrian soldiers, giving an example of a photo of King Ashurbanipal in his garden with the head of King of Elam hanging on one of the trees. Then he goes on to claim that because of wars, no more Assyrian men were left to join the Assyrian army, so they drafter the Arameans to fight for them. Now here is the million dollar question: Let's assume that Mr. Henry's claims are true, and that the Assyrian men were replaced with Aramean draftees. Then wouldn't that mean that it was the Arameans who committed those brutal acts, especially that the battle of Elam), took place at later days of the Assyrian Empire! If we were to accept Mr. Henry's argument then it was the Arameans draftees (within the Assyrian army) who destroyed Elam and beheaded the Elamite king! Let alone that Mr. Henry also claims that the Chaldeans were Arameans and that they destroyed Nineveh. Well in that case, wouldn't that imply that the Chaldeans had destroyed the Aramean draftees on the Assyrian side? Apparently it seems that it ended up to be an Aramean civil war between Arameans on the Chaldean side vs. Arameans on the Assyrian side (assuming that Mr. Henry's claims are true)! While Ashur Uballit II and his Assyrian people escaped west to Harran. Here is a very interesting quote from the Bible, which I would like to share with Henri Bedros who claim that Chaldeans and Arameans are the same! 2 Kings 24:2: "In his days Nebuchadnezzar king of Babylon came up, and Jehoiakim became his servant for three years; then he turned and rebelled against him. The LORD sent against him bands of Chaldeans, bands of Arameans, bands of Moabites, and bands of Ammonites"
Notice how the Bible makes a distinction between Chaldeans and Arameans. If they were the same then they would have mentioned one or the other! The same thing could be seen in the Assyrian kings annals where they describe different people which they deported through the Assyrian empire, you can also see here that the Assyrian king Sennacherib for example in his inscriptions makes a distinction between Chaldeans and Arameans, meaning that Henri Bedros Kifa's claim is false! The problem with Mr. Henry Bedros is that he makes claims to fit his agenda, but he doesn't think them through, and ends up shooting himself in the foot, when his theories backfire at him. He tried to polish the reputation of Arameans and ended up ruining it. There is a saying in Lebanon which goes like this: Jarrab yka77ila, 3ameha! (he tried to eye-line her, and ended blinding her).